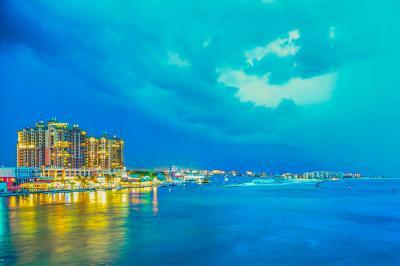 For a relaxing beach vacation, plan a trip to Destin located on the Florida panhandle's gorgeous Emerald Coast. Destin is popular for pristine beaches on the Gulf coast, a multitude of great golf courses, and its unique boardwalk. Fly into the airport at nearby Fort Walton Beach and use our limo service in Destin Fl to begin your getaway. Using our Destin limo service, you will arrive at your accommodations in style and class. You'll feel rested and ready for these 10 spectacular things to do in Destin. Destin's Harbor Boardwalk stretches for almost a quarter of a mile and gives plenty of access to the waterfront. The landscaping is lush, seating is plentiful, and it is well-lit at night. Several local restaurants and rental offices are located along the boardwalk. Destin Harbor's HaborWalk Marina is the perfect place to begin a day out on the water. Grab all the supplies you'll need at the Crab Island Convenience Store. Upon returning, stop in Nautical Treasures Gift Store for souvenirs, beach apparel, and jewelry. James Lee Park is county-owned and located on a beautiful stretch of sand. Swim in the Gulf of Mexico and have a picnic lunch at one of the pavilions with picnic tables. Kids can play at the beachside playground. Beach chairs and umbrellas are available to rent for a small fee. Drop by Flipper's Adventures and check out the exciting activities. They offer snorkeling, dolphin watch cruises, and sunset cruises. Tours are family friendly and all activities are safe even for non-swimmers. Enjoy 6,000 feet of shoreline at Henderson Beach State Park. In addition to the beautiful beaches, you'll find a park with a nature trail, a playground, and outdoor showers. Destin Snorkel has Coast Guard approved passenger vessels for all ages and abilities. They offer several different great tours from dolphin watching to sunset tours. For more excitement check out their SNUBA option, a technology that lets snorkelers dive up to 20 feet and stay underwater for half an hour. See a number of interesting exhibits at this unique Destin museum. Learn the history of the town and see photographs of early Destin settlers. Admire their collection of antique fishing rods one of which belonged to Ernest Hemingway. Take an afternoon out of the sun and head to Destin Commons. This shopping center features several local and national retail stores including Belk, Forever 21, and Bass Pro Shops. They also have an AMC theater and several onsite cafes. This interactive family adventure based out of HarborWalk Village takes place on a 100-foot vessel. Kids will be entertained with stories, songs, sword fights, water gun battles and treasure hunts. Adults love the scenery, and snacks and drinks are sold onboard. A favorite among locals, the Other End Restaurant, and Beer Garden is the best place around for scenic dining. Enjoy pub style food, craft beers and wine with a breathtaking view.